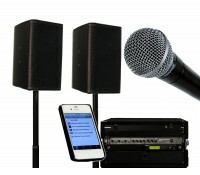 An iPlay Sound System from Avista is perfect for house parties, wedding receptions, memorial services, anywhere you want to play music and address an audience. Avista has created the iPlay Sound System to make it easy and affordable to host a holiday party, DJ your own wedding, The sound and great bass response from this professional grade system will impress everyone. Call us to book your rental now! We put the iPlay Sound System together to address the multiple events that need great sound for music amplification, and the ability to address an audience. Simply connect your iPod or other music source, plug the system in and your ready to go! The iPlay System includes a miniplug to connect your iPod, iPad, iPhone (or equivalent) or laptop music collection to the included mixer. Also included is a wireless microphone. Easily switch between playing music, and making announcements to your audience. Don't stop with the iPlay Sound System! Explore our site for other great additions to your party, including extra speakers and subwoofers, uplights, gobo projectors, and dance floor lighting packages. When you pick up your iPlay from one of our offices, we will gvie you detailed step-by-step operating instructions. If you forget something right before your event, no problem, give a call to our 24/7 tech support. iPlay Sound System Rentals Customers love us on YELP! (Moraga, CA) Avista did a great job of providing us with top notch audio equipment for a family special event. They were reasonable and dependable. They are very easy to do business with. I would recommend them and use them again. (Concord, CA) - I love Avista! I rented battery powered speaker from them twice. The first event got rained out, so I didn't end up using the speaker, but the second time around, it worked really well. They do a nice job of showing you how to use the equipment and provided spare batteries just in case, etc. Great place. I would highly recommend to others. (San Jose, CA) Renting a projection screen for your wedding is one of those things that you kinda don't think about until you're doing your inventory for all things you need about a week or two before the wedding and it hits you. The weekend rental policy was great. As our wedding was on a Saturday, we picked up the projection screen on Friday and were able to return it by Monday while only being charged for one day. Thanks, Avista!